For the Calgary Flames, their off-season success was almost as impressive as their unexpected and thrilling 2014-2015 run to the second round of the Stanley Cup Playoffs. 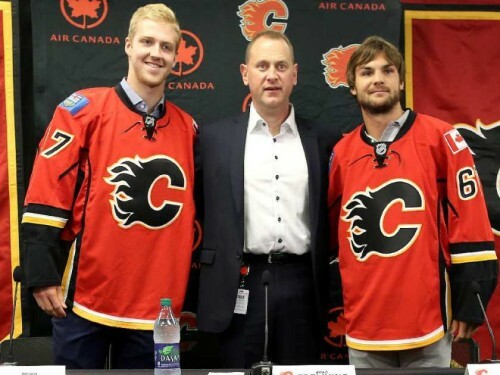 In the off-season the Flames bolstered their already strong blueline by acquiring their Dougie Hamilton, added some much-needed secondary scoring help by signing Michael Frolik, and extended the contract of Mark Giordano for another six years. Other than the additions of Hamilton and Frolik, the team you will see take the ice on opening night–October 7–will be much the same as the 2o14-2015 team. With little roster turnover, the question is will the 2015-2016 Flames be able to match or improve on the 2014-2015 team’s success? Or will the Flames succumb to the same fate as the 2014-2015 Colorado Avalanche who missed the the playoffs after taking the League by storm in the 2013-2014 season? As this writer has posted previously, he believes that the Flames are indeed in a position to build on the success of last season. Building on the success of a season ago will not be easy–nothing is ever easy the NHL’s Western Conference. The Flames will not be able to surprise teams anymore and they should probably limit their reliance on third period comebacks. Take note that teams like the San Jose Sharks, Los Angeles Kings, Colorado Avalanche, and Dallas Stars–all teams that Flame surpassed to get into the playoffs–will not all have similar down seasons that an upstart Flames team can take advantage of. Indeed, the 2015-2016 Flames have their work cut out for them and here is a little more insight on that group. In 2014-2015, the Flames relied heavily on the Johnny Gaudreau-Sean Monahan-Jiri Hudler line for offense. Last season, Jiri Hudler (31-45-76) paced the Flames offense but his career season can be solely attributed to playing with the talents of Monahan (31-31-62) and Gaudreau (24-40-64). Flames fans probably should not expect Hudler to repeat his career season but without a doubt these three (mainly Gaudreau and Monahan) will once again be relied to pace the offense. Flames’ fans are probably worried about the sophomore slump impacting Gaudreau and ultimately the team’s overall performance for the 2015-2016 season. Once again, as I wrote in my last article this writer does not believe in sophomore slumps. The dynamic duo played in every pressure packed situation for the Flames and delivered. Consider the lessons they learned from these situations, the leadership they receive from playing with Hudler, and their pure high-end skill the dynamic duo of the Flames will see their production rise this season. In terms of secondary scoring the jury is still out on this weakness for the Flames. Much of the pressure for secondary scoring will be placed on Mikael Backlund, rookie Sam Bennett, and newcomer Michael Frolik. With Frolik, the Flames insert a veteran and Stanley Cup winner who can play in any situation. He has had back-to-back 42 points season and this type of production will be welcomed to a team whose fourth highest scoring forward was Lance Bouma with 34 points. The bottom six forwards will be made up a combination of reliable and tough veterans including: Lance Bouma, Matt Stajan, Joe Colborne, Michael Ferlund, Josh Jooris, David Jones. Additionally, Brandon Bollig, Mason Raymond, Paul Byron, and Markus Granland will also see time in the lineup. The blueline is the Flames’ biggest asset. The impressive defensive unit includes: Mark Giordano, TJ Brodie, Kris Russell, Dennis Wideman and newcomer Dougie Hamilton. With Giordano, the Flames have their leader and a potential Norris Trophy winner. With the addition of Hamilton the Flames add another top pairing defenceman (he will start the season as Giordano’s partner) to their team. Hamilton is a smooth skater with a high hockey and defensive IQ thanks to his development in the Boston Bruins‘ sound defensive structure. Hamilton should fit nicely into the Flames defensive system and be a great addition to a mediocre power play unit. Russel, the shot blocking machine, is a reliable veteran defender (+18) that can play on a second or third pairing while providing some offensive punch (4-30-34). Similar to Russel, Wideman provides reliable veteran depth that can handle a lot of tough minutes for a young team. Last season, he stepped up big time in the absence of Giordano setting a career high in goal, assists and points (15-41-56). Finally, Brodie will be missed while he sits out 3-6 weeks with a broken bone in his hand. Last season as Giordano’s partner, Brodie showed he offers a solid mix of offensive prowess (11-30-41) and defensive zone awareness (+15). Last season, the Flames received a lot of production from its blueline and with the addition of Hamilton there is no reason to believe that this will not be the same for 2015-2016. With still questions about the secondary scoring from the forwards, the Flames success could hang in the balance of the level of production from what should be one of the best defensive units in the NHL. Second to the team’s questions about secondary scoring, many consider goaltending to be a concern for the 2015-2016 Flames . Jonas Hiller started 52 games last season but Karri Ramo and Joni Ortio both showed that they could be relied on when duty called in Bob Hartley’s platoon goalie system. The Flames held the League’s seventeenth ranked goaltending statistics last season, behind a stronger defence corp this season those numbers are bound to improve. There is no doubt the Flames have depth and veteran experience in goal. With Ortio seemingly ready to take on an NHL role, the Flames have three potential trade chips to use if they do have trouble scoring to start the season. Neither the powerplay or penalty kill were strong points for the 2014-2015 Flames. The power play finished the season ranked 14th in the League (48 goals, 18.8%) and the penalty kill ranked 20th (80.6%). The additions of Frolik, Hamilton, Bennett, and a healthy Giordano should help both of these statistics. Specifically, Frolik can be signified as a dynamic penalty killer due to his speed and work ethic. He also finished tied for fifth in the NHL with three shorthanded goals last season. If the Flames are indeed going to build on last season’s success, special teams play must be improved. The Flames will not be surprising anyone this season, which makes it that much more crucial for the team to not rely on third period comebacks. Also, the Western Conference and Pacific Division are tough as the Kings, Avalanche, Stars, and Sharks are not all going to have underachieving seasons again. The Flames can counter these obstacles if: 1.) Their blueline performs to its high-end capabilities 2.) The top-line continues to pace the offense and add to its stellar 2014-2015 season. 3.) The secondary scoring that is needed comes from Frolik, Bennett, and Backlund 4.) The goaltenders remain steady–they do not have to be stellar. Fair warning to fans: If the blueline or top line underachieves it may be a long season in Calgary. 1.) Anaheim Ducks – Corey Perry and Ryan Getzlaf should be enough of a justification but they also have depth at every position which makes them tough to beat. Plus, they were so close last year making them even hungrier this year. 2.) Los Angeles Kings – Look out Anze Kopitar is in a contract year. Plus, they have Drew Doughty and Jonathan Quick which means they won’t be held down for long. 4.) San Jose Sharks – Other than the coaching staff and newly minted starting goalie nothing has changed for this aging core group. Last call for the group is approaching. 5.) Vancouver Canucks – Honestly, who knows about the Canucks? If Miller regains his old stellar form, the Sedin twins perform like they did a few seasons ago, and the incoming youngsters meet expectations this team could be slotted in behind the Ducks. However, I don’t think the stars will align for all these factors to take place. 6.) Edmonton Oilers – Connor McDavid will improve a lot of things but even he cannot fix their lack of depth on defence. The jury is still out on Cam Talbot who played behind a solid defensive unit with the New York Rangers. Lacking defence in the Western Conference is not a formula for a drastically increased win total. 7.) Arizona Coyotes – Rebuilding but will surprise teams if Mike Smith regains his 2013-2014 form and Max Domi and Anthony Duclair play like they did in the 2015 World Junior Hockey Championships.